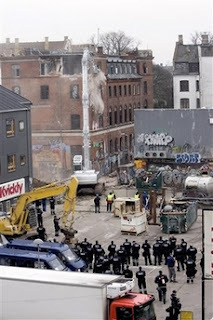 Copenhagen, Denmark - After days of rioting demolition crews began demolishing the Ungdomshuset (Youth House.) Workers wore masks to hide their identities and were required to work under a heavy police guard. Tearful crowds of youths and their supporters shouted obscenities at the workers and the police. The building has been home to an autonomous youth community center since 1982, but it's radical history goes back much further. It was built as a community theatre for the labour movement in 1897. Both Denmark's women's liberation and trade union movements were founded under it's roof and the building even hosted Vladimir Lenin when he visited Copenhagen in 1910. Riot police used helicopters to storm the building Thursday and arrested the 35 occupants setting off three nights of violent clashes between police and protesters. The riots have mellowed out but demonstrators claim that they have "only just started!"